POKE, pronounced poh-kay (meaning small pieces) has a long history in Hawaii. For hundreds of years, fishermen on the islands have been consuming poke, made by seasoning bite-sized pieces of ahi tuna, as snacks. The seasonings used are varied but mostly Asian-influenced such as soya sauce, sea salt, sesame oil, wasabi and roasted candlenuts. In the 1970s, cookbooks in Hawaii began including recipes for poke. Since then, the dish has appeared in every Hawaiian restaurant. In June 2016, the first poke festival was held in Hilo, Hawaii, and showcased more than 2,000 mind-boggling variations of the Hawaiian comfort food. There’s no need to fly to Hawaii to taste poke as it has been brought here by The Fish Bowl, a restaurant in an industrial area adjacent to a private college. As I step into the restaurant I am surprised to find myself in a factory lot furnished with wooden tables and metal chairs. The ambiance is clinical; almost everything is shiny and metallic. Track lighting provides illumination, and the far end of the hall is outfitted with a drink dispenser and a cooler packed with bottles of cold pressed juices and coconuts. At one side of the hall stands a glass display counter containing metal trays filled with all kinds of ingredients. This is a self-service restaurant so I take an order sheet from a rack, snag a table and start ticking the check boxes. 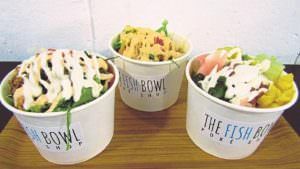 To order my poke, I have to first choose my base: White rice, brown rice or baby greens. Next, I have to pick my four sides from a choice of 16 veggies and nuts. For protein, I have to choose from one of the following: Shoyu tuna, spicy shoyu tuna, garlic shrimp, shoyu salmon, kaffir lime salmon, honey-herb chicken. Add-ons available at additional charge are avocado, salmon skin and poached egg. The next step is to decide my toppings. There are 16, including pickled ginger, sesame seed, chilli flakes and wasabi. Finally, I’ve to choose my sauce from lime aioli, garlic sauce, baby racha and monster racha. I think the latter two are fancy names for sriracha sauce. After placing my order and paying for it, I wait for my order number to appear on the big digital counter on the wall. I return to the counter to take my paper cylindrical bowl which is filled. My poke is made up of white rice, seaweed, pineapple, mangoes, walnuts, shoyu salmon, pickled ginger, pickled cucumber, and pickled radish, and topped with lime aioli. I eat a few mouthfuls of plain rice which is fluffy. After mixing the ingredients, I eat it. A gamut of flavours dance gracefully on my taste buds – from the earthy tones of the walnuts to the sour tang of the pickles and the oceanic freshness of the salmon. Great balls of fire! The back-to-back change of flavours is like poetry in motion. Weaving into the veil of flavours are the various gentle textures which remind me of sushi but there’s also the exciting crunch from the veggies. No wonder, poke has been described the new sushi by Hawaiian chefs. Before long, I am digging into another bowl of poke. This time, the base is baby greens and a poached egg serves as add-on. Tomatoes, onions, edamame and seaweed form the sides. Toppings comprise green onions, pickled radish, seaweed flake, sesame seed, furikake, fried shallot and fish roe. Drizzled atop the heap is baby racha. A mouthful of the poke unleashes a dainty swirl of flavours in my mouth but they are a tad weak. 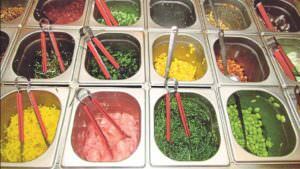 For poke, one must choose fewer ingredients for more robust flavours. And the copious quantity of greens has turned this dish into a salad.